What an amazing week! Jonny was a brilliant Guide and I can’t thank him enough for his calm and simple approach to each day. We look forward to seeing him again! Karen was also lovely. I have learnt so much and Jeremy and I are already thinking ahead and getting some ideas together for our next summit! Chamonix is a fab location and we will certainly be going back to do more climbing. We also loved the chalet as it was a great combination of scrummy food and location so a top recommendation. We had a great week – thoroughly enjoyable. Summiting Gran Paradiso brought Sam to tears (happy ones) and the day was awesome – some of the best underfoot conditions imaginable and blue skies too…! Chalet Tissieres is lovely – would struggle to find a more perfect place and setup to use as a base for a mountaineering / climbing trip. Please would you be kind enough to pass on my thanks to Dave for a thoroughly enjoyable and constructive trip. Dave was fantastic, and I would have no hesitation in recommending him and your course to others with similar interests in future. Just a note to say thanks for all your help and advice leading up to the trip. It was a great success and Al was all I’d imagined he’d be. It was great fun but the teaching was very professional. We covered loads of stuff and he was ready with back-up plans when we needed them. I feel that independent alpine trips are now nearer my reach but I think that a guided ascent of Mont Blanc will probably be next. Speak soon and have a great season. The trip was awesome. The 4000m course was fantastic, learned loads and would definitely be comfortable taking on some PD climbs in the future. Chalet Tissieres was excellent lovely and clean and excellent food to be fair. The huts were grand and as I expected: good food on show as well, though Italian and French hut breakfasts are an acquired taste!!! I will definitely be back next year. Thanks again Rich for making both of my trips possible. The trip was fantastic, it exceeded all of my expectations. The organisation was brilliant. Al was an excellent guide. Not only knowledgeable, but someone to enjoy a meal and a chat with. I would unquestionably recommend Al and Alpine Guides and I look forward to joining you on another trip. Just wanted to say thank you so much for organising such a brilliant course for us last week. We both had a great time, got a lot out of it and Dave was a great guide. Thanks again Rich, I’ll hopefully be in contact soon regarding next summers adventure! The accomodation, the organisation, Al’s guiding and the route choices were all top notch and I felt like the week led-up well to the Gran Paradiso. I came away feeling proficient in the ropework etc, mainly as Al encouraged us to do it ourselves where possible once we’d learned the initial skill, which is the way I learn best. Everything with Alpine guides was fantastic..truly! Al was superb and it was really a privilege to have been with for a week…learned loads. I’ve so much more to learn (the now conscious incompetent!! )…but ive so enjoyed it. The Chalet is great…what a view! And the staff and food were brill. All in all it was super and don’t be surprised if you have me bothering you again next year!!.. and I really appreciated how personal you guys make things. Wanted to thank you for a fantastic week – Lori was superb and feel like I really learned an enormous amount (and had a lot of fun into the bargain). Was really a pleasure to climb with him. All the accommodation and planning ran smoothly. Will definitely be looking to do some more climbing with you soon. Important areas covered include snow and ice skills, glacier travel, moving together, crevasse rescue, route choice and planning, navigation, weather and hazard evaluation. This is an introductory level trip. To take part you should be at Fitness Level 2 and Tech Level 1-2 (see our Fitness/Experience guidelines). You need good general fitness and experience in UK mountains (summer or winter). Some scrambling or rock climbing experience is also desirable if you want to progress onto more technical terrain. One UIAGM guide climbing with 3 clients. Our meeting point and Chamonix valley base is Chalet Tissieres in Les Bossons, just 5 mins by car/bus from Chamonix centre. The chalet stands in its own 2000m2 alpine garden with stunning panoramic views of Mont Blanc and the entire Chamonix valley. It offers simple but comfortable shared rooms, a large lounge/dining area, honesty bar, and a huge balcony for al fresco dining on warm summer evenings: a great place to relax after a big day in the mountains. The chalet serves a buffet breakfast and varied 3-course evening meal***, with special diets catered for upon request. Rooms are provided on a twin (or occasionally 4-6 person) sharing basis, but if you prefer a single room please let us know and we will confirm availability. ***The chef has one night off each week – this day will include bed and breakfast only, but the chalet will recommend an alternative local restaurant. Hotel details can be found on our Accommodation page. For overnights in the high mountains, we will use mountain huts. For more info please read the Using Alpine Huts article which provides an overview of typical facilities, average costs to help you budget for lunches/drinks, and general info on hut etiquette. (NB ‘Course Only’ Options are also available. If you’d like to book a place on the course only and arrange your own accommodation, then please get in touch). You should arrange outward travel on Sunday, arriving by 5-6pm latest in time for the briefing at your accommodation. Your guide will run through safety routines and kit checks, as well as hand out any rental equipment for the week, before we go on to discuss everyones aims and ambitions for the course, together with the current weather and mountain conditions and how these affect our course planning. Essential snow and ice training, including crampon and ice axe skills and glacier travel – taught on the Mer de Glace above Chamonix. These essential snow and ice skills are best learned on the lower reaches of a glacier. To begin with we do a lot of movement coaching – teaching you how to use your crampons and ice axe to best effect and improving both footwork and co-ordination skills. We then look at roping up for glacier travel, practicing knots and ropework to safely negotiate crevasses and other hazards. For the final part of the day we look at other ice techniques of the interest to the group – examples include steeper ice climbing with 2 tools, building ice belays, prussicking out of a crevasse, abolakov threads etc. Skills training focussing on moving together on snow and crevasse rescue training. The day starts with a drive through the Mont Blanc Tunnel, in order to use the Hellbronner Cable Car on the Italian side of the range to reach the Torino Hut. From here, we climb the Petit Flambeau North Ridge. In the afternoon we do a crevasse rescue session, covering skills appropriate to your ability and experience. A Group Haul – this is a safe, simple solution with 3 or more rescuers. Self Rescue by Prussicking – the victim prussicks up the rope to escape the crevasse. A full blown Crevasse Rescue – 0nly once you’ve exhausted 1 and 2 do you go on to 3! For those with experience building snow belays, we may also cover advanced crevasse rescue skills before heading to the Torino Hut for the night. After a communal evening meal in the hut, our evening briefing looks at using alpine huts, alpine weather forecasts and alpine route planning – preparing for the climb on Wednesday. Overnight at the Torino Hut. 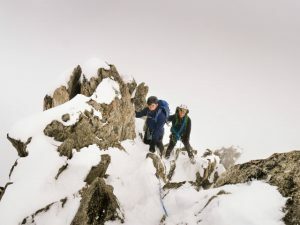 During coaching and training sessions, you will be practicing different ropework and protection techniques and applying them in as many different situations as possible – in order to develop sound judgement and decision making skills in real alpine terrain. If you have rock leading experience, then we’ll also look at short pitching and direct belaying techniques during the day. PM Return to Chamonix. Overnight in valley. prussicking, rock climbing, belaying etc. In the afternoon we then drive across to the Gran Paradiso National Park in Italy and walk up to the Vittorio Emanuele Hut for the night. Evening briefing – planning for the ascent of the Gran Paradiso, including a short talk on alpine rescue, using guidebooks and how to obtain reliable and up to date climbing conditions information. Ascent of Gran Paradiso – via the classic west flank route. After a pre dawn ‘alpine start’, the route followed depends on conditions – when it’s snowy the glacier route is quickest, but in drier conditions the rock ridge is a better choice. At 3700m, both routes converge, then follow the same line up the glacier to the final summit rocks. Here, a 100m of trickier scrambling lead to the highest point, with geat views and a welcome rest before the long descent. Alternative 4000m Summits – if weather or conditions prevent us from making an ascent of the Gran Paradiso, then we’ll attempt one of the following other 4000m peaks instead: Weissmies, Allalinhorn, Breithorn, Lagginhorn, MB de Tacul, Alphubel, Pyramide Vincente. Descend to the valley in the evening and drive back to Chamonix – course debrief and advice for the future. Early departures – if you choose to depart on Friday night, please leave plenty of time for repacking and airport transfer. You will typically be back at the hotel by 4-5pm at the latest, so choose a flight departing Geneva after 9-10pm. We base ourselves for the week in the famous French resort of Chamonix, in the shadow of Mont Blanc. 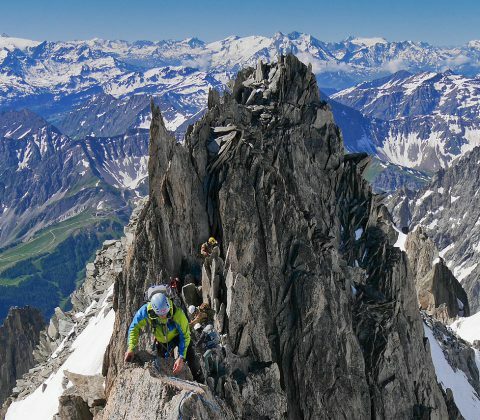 Chamonix is one of the most famous Alpine centres in the world, with an unparalleled range of quality climbing across all grades and styles, and much of it with convenient cablecar access. The most common way to reach Chamonix is fly to Geneva, then take a shared taxi transfer to the Chamonix valley – transfers will drop off at the destination of your choice, but must be booked in advance. Fly to Geneva with numerous budget airlines: for an overview of the best options check out the excellent Sky Scanner flight comparison website. Alpine Mountaineering is a strenuous endurance sport – ie to get to the summit involves slogging up hill for hours on end! Therefore, your fitness and power to weight ratio are very important factors for success. Another important factor is altitude, which people react to in different ways and finally, you need the appropriate technical climbing ability for the trip – please check that you have the correct fitness and tech levels for your trip using the Tech Level and Fitness Level descriptions below. This is a key factor – you must be at the minimum Fitness Level quoted for your course (see descriptions below). However, the fitter you are the more you will enjoy it and the greater your chances of success. Being fit also helps you to recover more quickly between climbs during the week. What shape you are has a big impact on your likelihood of success! Eg are you slim and athletic, a normal build, a bit overweight, or 1-2 stone or more overweight? If you are considerably overweight, your chances of making it to the summit are not high, even with reasonable fitness (although the two don’t usually go together), good weather and perfect conditions. If you are carrying any excess weight, then you need to lose as much of this as possible before joining the trip. All of our alpine trips involve an acclimatization climb at the start of the week, but everyone responds to altitude in different ways and personal speeds of acclimatization vary widely between individuals. Past experience is a fair indicator – so if you have coped Ok at altitude before eg. on a previous alpine trip, Kilimanjaro, or on a high altitude trek, then this should be good news. Conversely, if you have had problems or been slow to acclimatize before, then you definitely need to come out early, in order to pre acclimatize before the week starts – please contact us for further advice about this. If you need to top up your fitness for this trip, please see our training advice page. Hillwalker/scrambler. You have UK hillwalking and perhaps summer UK scrambling, or European via ferrata experience – but no rock or ice climbing, or previous alpine mountaineering experience. Novice climber. Indoor or outdoor sport climbing experience / seconding traditionally protected climbs at V Diff – Severe standard / winter hillwalking or mountaineering using an ice axe and crampons / alpine glacier treks or alpine peaks to F standard. Intermediate climber. Leading single or multi pitch trad rock climbs at Severe – VS / ice climbing experience seconding routes to Scottish grade 2 – 3 / familiar with multipitch abseil descents / alpine peaks at PD – easy AD standard. Experienced climber. Leading multi pitch trad rock climbs at VS – HVS / multi pitch winter climbs to Scottish grade 4 / alpine peaks at AD – D standard. If you mainly climb with guides or seldom lead climb, you have extensive experience seconding at this standard. Very experienced climber. Regularly lead multipitch E1+ trad rock / ice and mixed routes at Scottish 5+ or WI5 / alpine routes at grade D and above. If you mainly climb with guides or seldom lead climb, you have very extensive experience climbing at this level. Above all, alpine climbing kit needs to do the job, but be as light as possible. We work with various manufacturers including Arc’teryx, whose products we can thoroughly recommend. 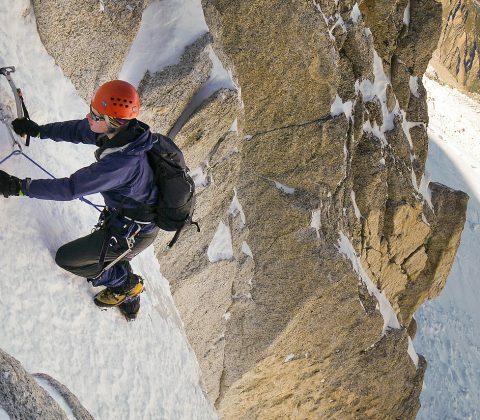 Our Essentials alpine mountaineering course in Chamonix is taught by British mountain guides. 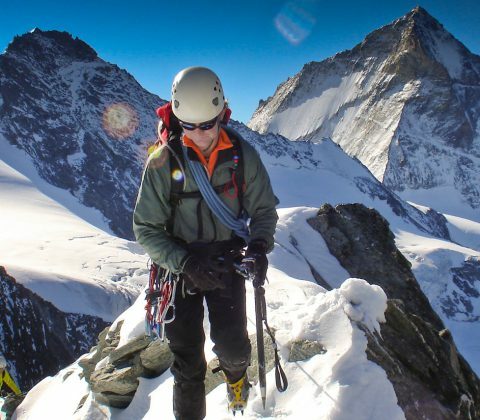 This is a short, intensive 3-day course covering essential alpine skills - it's designed for uk climbers who already have rock or ice leading experience and now want to climb independently in the Alps.